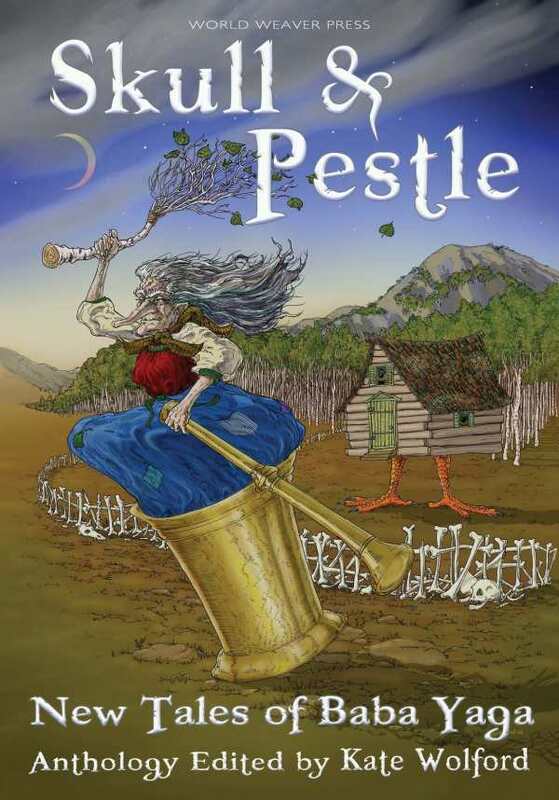 Skull and Pestle, edited by Kate Wolford, gathers seven short stories that revive Baba Yaga’s legend, alternately retelling her original tale or transporting her through time and space to unexpected places. Women find Baba Yaga in nexus moments, the points where natural transitions and extreme need cross. An enigmatic figure, she’s a “crone who ruthlessly uses the needy and greedy for her own devices,” and each tale finds its own way to explore her complex, contradictory, but always fair nature. Several stories delve into Baba Yaga’s yearning for the girls she helps. Although the subtextual homoeroticism is palpable, it’s resolved via platonic or filial relationships, with one notable exception: Charlotte Honigman’s World War II revenge tale, where the heroine is helped by her lady love. The memorable stories always transform some element of the legend. Lissa Sloan’s “A Tale Soon Told” establishes a pedigree for Baba Yaga in a beautiful kinship story about women claiming each other on the journey to become themselves. Szmeralda Shanel’s “The Swamp Hag’s Apprentice” re-envisions the legend as black American folklore. But the collection’s crowning achievement is Jessamy Corob Cook’s “Teeth,” which turns the tradition inward to explore Baba Yaga’s relationship with her own sister. Its haunting conclusion highlights the fact that there’s no punishment worse than the psychic pain a person lavishes on herself. These are women’s stories in that they’re about the bargains women make and the cost of the knowledge and salvation that women buy for themselves as they make their way through the world. Although Baba Yaga functions as a mentor, her guidance is brutally realistic: You’ll be asked to do the impossible in order to survive, and there will always be a cost.